My sons decided to go roller skating outside at our house the other day. Our 5 year old decided to just go for it and had no problem. I think that kid has no fear. Then the three year old was going to try. 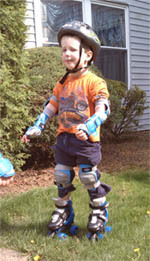 First, he puts on enough pads to make himself look like a blue Iron Man. Then he checks them. Then complains about his helmet not being tight enough. Then too tight. Then he gets ready again. Ultimately the process of padding up takes about 15-20 minutes. Skate time lasts about 3-5. My wife said that the other day, she wasn’t even sure if he ever got off the grass onto the sidewalk. He gave up. A lot of times, we give up before the hard stuff even starts. We spend way too much time preparing – beyond what is reasonable or necessary. We procrastinate by doing other “good” things. There comes a point though, where we need to just take action. We need to make a move. I was reading through Hebrews 11 today. One thing that we don’t often think about as we look down the list of names of people who displayed faith was that they took action. Yes, they believed and had strong faith in God, but they acted on that. Many of them had no idea what was going to happen, but they acted. They didn’t wait and wait and walk away. They jumped. They moved. They put everything on the line. Sometimes I wish I was more like my older son. He tried to jump down the hill onto the sidewalk. You’ve got to give the kid credit for trying. He wasn’t satisfied sitting around. He went for it. What are you procrastinating that you need to finally jump into? Where is your faith taking action? Where is it not? What’s keeping you from jumping?